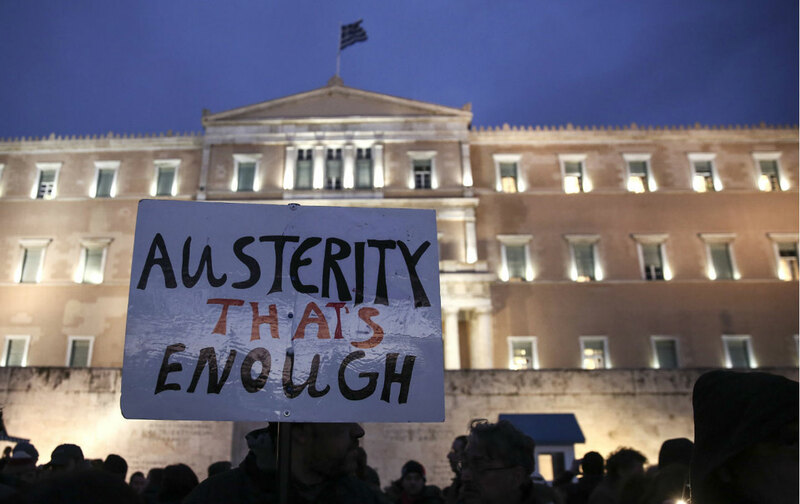 Austerity Has Been Discredited. So Why Won’t It Die? Greece has been pushed to the brink not to help its economy, but to show who’s in charge. As Greece confronts a new round of brutal austerity measures (the alternative is leaving the eurozone), the rest of Europe is watching. “When citizens repeatedly vote for a change of policy…but are told that these matters are determined elsewhere or that they have no choice, both democracy and faith in the European project suffer,” the economist Joseph Stiglitz wrote. With a Eurocrat elite in Brussels overruling the recent referendum and including in its proposals direct supervision of Greece’s economic policies, even voters in well-off countries have balked. The United Kingdom is due for a vote on continued EU membership, and Labour politician Andy Burnham has warned “that the EU is becoming associated with a right-of-centre economic orthodoxy that is being imposed on all parts of the EU.” Hundreds of thousands of people on Twitter stated their opinion on the troika more concisely: As the Greek negotiations reached their 16th hour in Brussels, #ThisIsACoup trended at No. 2 in the world, and No. 1 throughout much of the eurozone. The liberal project of European integration is emerging as a coercive mechanism: one in which democracy, dignity, and sovereignty are ripped from economically weak countries for the benefit of the strong. The left should be doing some hard thinking about the eurozone and its role—if any—in a democratic Europe. Editor’s note: An earlier version of this piece incorrectly stated that the United Kingdom is due for a vote on continued eurozone membership. The United Kingdom will be voting on continued membership in the European Union. The text has been updated to correct the error.